"We are a multicultural community of doulas and educators supporting gentle birth and breastfeeding, confident families, and overall reproductive health justice in Upper Manhattan and The Bronx. We are a worker-owned cooperative of women and moms of color who believe in the power of both education and individualized support to create our shared vision of healthy families and healthy living. Uptown Village Cooperative teaches affordable family health workshops and provide high-quality holistic support as experienced birth and postpartum doulas, lactation consultants, health and nutrition coaches, fitness instructors and therapeutic bodyworkers. We also offer continuing education in maternal, reproductive, and infant health to professionals committed to strengthening our "UPTOWN" community of New York City." Too often, women in under-served communities do not have access to holistic birthing services such as breastfeeding support, doula services, yoga, to name a few. We are so proud that the 4 women of Uptown Village Cooperative have united their forces to bring these much-needed services that helps expectant families make the most informed decisions with regards to their birth plans. Uptown Village Cooperative graduated in the Fall 2015 cycle. How did your group form? In spring of 2015 LaShanda started organizing a monthly potluck for birth professionals in the Uptown area. A few of us regularly came together, from Harlem, Washington Heights, and the Bronx. 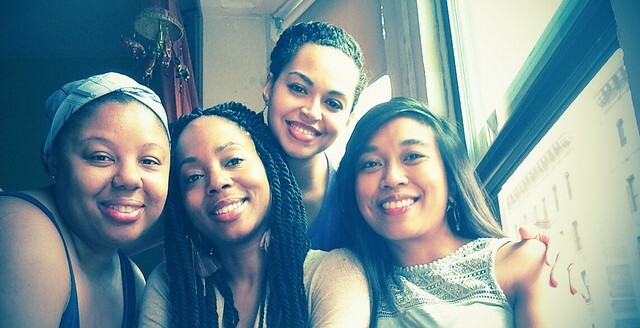 Amidst various awesome birth and family topics we delved into, we often discussed our collective vision of having a strong community of multicultural birth professionals in the Uptown area. We each related to the desire or interest to work with individuals we connect with, which may include a cultural aspect. This shared interest caused us to explore how to increase options for families, notably for women of color, in our communities. We wanted to mobilize our own community of doulas and educators supporting gentle birth and breastfeeding, confident families, and overall reproductive health justice in Upper Manhattan and the Bronx. How did you learn about the Co-op Academy? The timing was nicely synchronistic. A couple members of the crew heard of Green Worker's Co-op Academy a year prior, like a seed planted. Then in the thick of our momentum, while planning and envisioning how to move forward, a colleague told us about the program at Green Worker and how fitting it may be. It was fall of 2015, just happened to be a couple weeks before the beginning of a worthwhile 20 week commitment. What where the decisions behind choosing which of your members where to participate in the intensive 5 month program of the Co-op Academy? We took an honest assessment of who had the time and space to commit. And because we found out about the program so close to its outset, we figured out if and how we could carve out some availability to attend Monday evening sessions. LaShanda and Myla were the ones who could commit to being physically present for the full time, yet it was so great to have energy and input from our extended support team. How has the Co-op Academy influenced your decision to effectively "pull the trigger" and launch your business? The Academy gave us the foundation, ongoing support and resources to help us come together and continue the momentum. Meeting regularly, learning a ton, and completing such an extensive program has helped us tremendously. Exercises and assignments allowed us to delve into our perceived business plan and re-shape it again and again, testing our ideas, learning about the market, understanding our customers, choosing a structure that best serves Uptown Village Cooperative, thus empowering us to make decisions more confidently, and providing us with amazing resources along the way!! Describe a highlight of your time at Co-op Academy. As participants, there were times when it was difficult to juggle our own life commitments alongside our obligations with the coop academy. Ultimately it helped us learn to work together, communicate better, collectively problem-solve, and delegate tasks when necessary to benefit our business as a whole. Would you have started a business together without GWC Co-op Academy? Yes, we were already planning the next steps to establish a business, yet the academy opened our eyes up to the cooperative world, and we are thankful for it. What aspects of your existing business you are most proud of? We are proud to have developed and implemented workshops events and programs with a mission to enrich through education. We are increasing access and options in our community, and promoting healthy families and healthy living. We are excited about the fact that we are building and growing our community of WOC in the perinatal and postpartum profession. You are now in start-up mode, what are your overall goals for your cooperative? We want to continue to shape our business structure to be awesome amazing and functional. We want to continue to build and grow our community. We’d love to have sponsorship for the free events we offer. We aim to one day have a dedicated space where we can offer all of our services more frequently. In addition to our family health workshops, birth and postpartum doula support, breastfeeding counseling, we would like to increase our collective service offerings to include health and nutrition coaches, fitness instructors and therapeutic bodyworkers. We aim to also offer various continuing education for professionals in maternal, reproductive, and infant health fields. We expect to start a crowdfunding campaign this spring to help support us in achieving some of these goals! We have a monthly breastfeeding group in Washington Heights every second Saturday at Small Idea Daycare. Our website is under construction and we expect it’ll be ready this spring 2017! Feel free to drop by and fill out a contact form; let us know about your interests. Send us an email if you are interested in more information about New Moms Group, Prenatal Breastfeeding Class, Newborn Care Class, or educational offerings for doulas. Ihotu Ali is a doula, licensed Massage therapist, and holistic health coach with a background in global health policy where she worked with obstetricians and Midwives in Africa and the Caribbean to fight maternal and infant deaths. She focuses on fitness, nutrition, and stress relief to prevent premature birth, complications from cesarean sections, and perinatal depression especially among low-income and immigrant women. Myla Flores is a doula, childbirth educator and lactation counselor. A birth worker for nearly 10 years, she has served 160+ families as a birth doula and 20+ postpartum families. Myla studied nursing, then changed paths to receive her degree in Theater and Psychology from Rutgers University. She supported with initial stages of opening a birth center with Mother Health International. She is richly experienced in teaching childbirth education classes, supporting birth in all settings, and as a birth assistant. LASHANDA DANDRICH is an IBCLC and DONA trained Postpartum Doula with 3+ years of postpartum experience and 20-30 families served, with a unique skill: speaking baby! As an International Board Certified Lactation Consultant (IBCLC), LaShanda works with NYU, Beth Israel, DOH, NMPP conducting hospital based and community breastfeeding groups and classes, home visits, and attending to mothers and babies on the Mother/ Baby units and NICU. Lashanda also is receiving training to be a Childbirth Educator this spring of 2016!! Winter Parris is a Full-Spectrum doula, trained with Ancient Song Doula Services, which includes education in Birth and Postpartum Support. Winter has special interests in supporting families in postpartum period, and received deeper awareness with DONA’s Postpartum Training. She has continued to be an advocate for women with Perinatal Mood and Anxiety Disorders and finds herself passionate about increasing postpartum depression awareness. Winter is a Certified Lactation Counselor and Yoga Teacher. She works with Healthy Women Healthy Future’s community doula program. WOOP WOOP!! Go Myla, LaShanda, Winter & Ihotu!